Earlier this year, California Governor Jerry Brown signed a bill into law which will increase California’s minimum wage to $15.00 per hour by 2022. While the increase in minimum wage will obviously impact hourly, non-exempt employees, it will have a significant effect on the compensation and earnings of exempt employees as well. For example, for an employee to be properly classified as exempt from overtime, the employee must satisfy the requirements of an established exemption (such as an executive or professional). Most exemptions require both the performance of certain duties and responsibilities and the payment of a minimum salary. 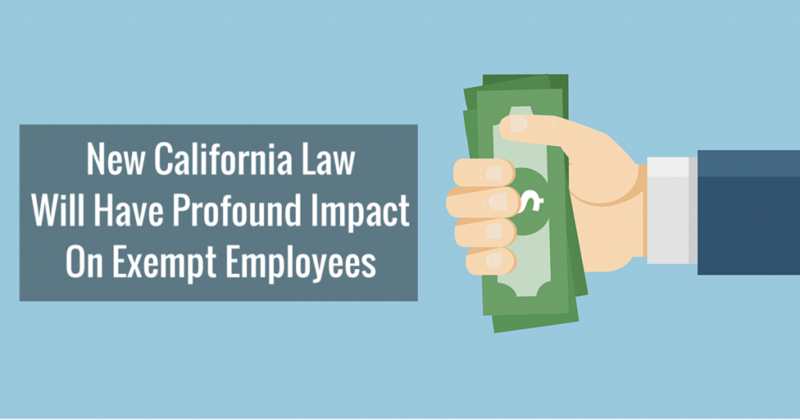 In California, to qualify for the administrative, executive, or professional exemption, an employee must be paid no less than twice the State minimum wage. Today, this equates to an annual salary of $41,600.00. By 2022, that will rise to $62,400.00.Therefore, California’s increased minimum wage has a profound effect on all employees, not just those classified as non-exempt. California law does not allow anyone to simply be classified as exempt without the payment of overtime. As an employment law attorney in Orange County I can tell you firsthand, misclassification of exempt employees is a common mistake among California employers, especially based on an employee’s duties. If it is determined an employee is misclassified as exempt, the employer must then compensate the employee for overtime hours(over 8 in a workday and over 40 in a worker) at a rate of time and a half their hourly rate of pay. Depending on the circumstances, an employer may then also be liable for the payment of meal and rest period premiums for such violations, and penalties for failure to timely pay wages and inaccurate itemized wage statements. If you have a questions regarding your classification as an exempt employee, and whether you meet either the salary or duties test to be exempt from overtime compensation, please contact the employment law attorneys at Ares Law Group who have substantial experience dealing with this and all types of employment issues.